On that Mother’s Day, I waited in bed for a breakfast that never came. Finally, smelling something delicious, I wandered downstairs to find my husband sitting on the sofa eating leftover barbecued duck. Our children were nowhere to be seen. They were certainly not labouring over a handmade card detailing my wonderfulness. In less than 10 seconds, I became a boiling kettle of resentment. My husband looked up, fork raised, and froze. He would later say, “Your eyes were like burning little coals.” I had become the Eye of Sauron, except that I had two eyes, and they were in the middle of my face, and my face was saying in no uncertain terms: Where the hell is my Mother’s Day breakfast? Was it so much to expect? All year, I sweated blood for these people, because I loved them. All I asked for in return was a few measly strips of bacon, some mixed berries and whipped cream. From a can. Once a year. Of course it was about more than breakfast. My husband is more than an equal partner on the home front, but this was about the labour I’d performed on their behalf that went unacknowledged for months on end – the forms signed and the hair brushed and the presents bought and the risotto lovingly cooked using home-made chicken stock, only to have it pushed to one side with a grimace and the words, “Why is it so slimy?” What I performed, unseen, was the family-glue drudgery that we now call emotional labour. And here we arrive at the dark, knotty, unswept heart of the dilemma: Ms. Hartley wanted her husband to research cleaners, find some, call them, get quotes, arrange a date and pay the invoice. She wanted him to know that the effort of caring about her desires was as important as the clean house itself. She wanted him to take on some of the emotional labour that she grimly performs on their family’s behalf. Ms. Hartley’s husband is named Rob, he tries very hard and, by the end of the book, I wanted to take him out for a beer. In September, 2017, after the house-cleaning incident, Ms. Hartley wrote a story about emotional labour for Harper’s Bazaar, titled “Women Aren’t Nags – We’re Just Fed Up.” It went viral. Not the kind of viral you’d catch from a non-professionally cleaned house, but the kind that is shared by nearly one million readers – almost all of them women, and I’d bet my unused feather duster on that. 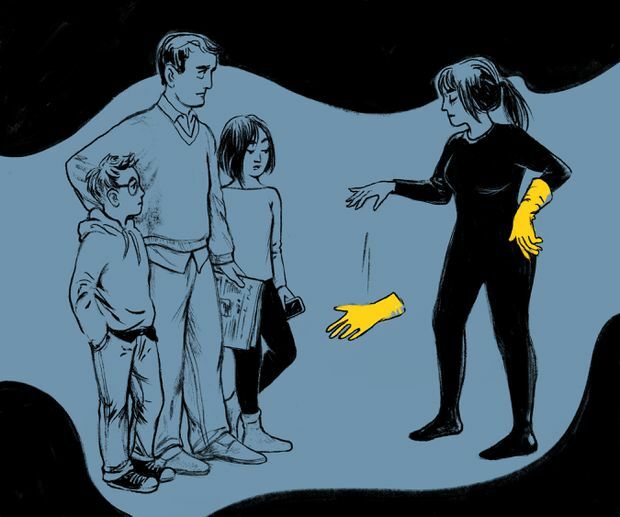 The accompanying illustration, quite brilliantly, featured a used yellow rubber glove, its middle finger pointing skyward. Ms. Hartley offers a definition of emotional labour at its most basic: “It is the unpaid, invisible work we do to keep those around us comfortable and happy.” And not just the work itself, as Ms. Hartley points out, but the mental labour of organizing that warm and tidy life: remembering to buy a present for your father-in-law’s birthday, and the date for swimming-lesson sign-up, and the baby-shower collection for Sue in accounting. What you will notice between the lines in that last sentence is an absence. An absence of men. Emotional labour is largely women’s work, for better or worse. And this is the crux of Ms. Hartley’s book: How do we get men to care more? It becomes clear through the pages of Fed Up that the thing she wants her husband to care about is domestic in nature. That is, she wants him to want precision-folded laundry and a clutter-free table as much as she does. This, it strikes me, is the fundamental problem in the current discussion about emotional labour. 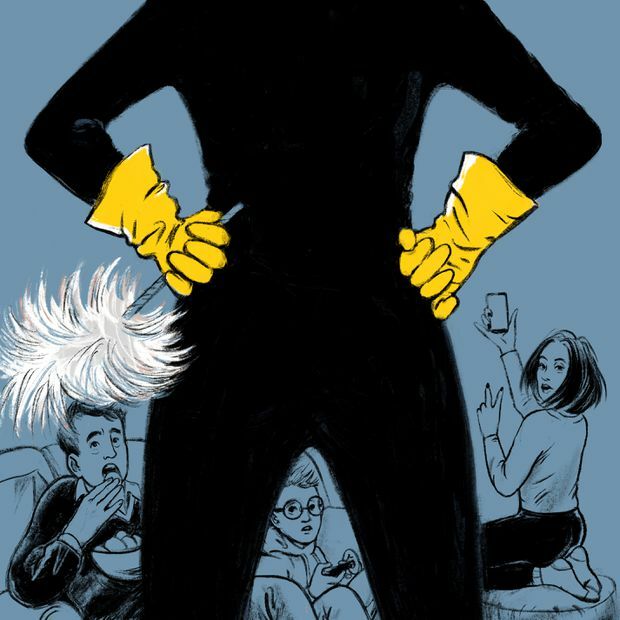 It has come to be all about housework. The devaluation of caring is a fascinating issue, and it requires us to ask hard questions about how we diminish those who look after other people, personally or professionally. If we’re going to talk about emotional labour, it has to be about more than whose dirty socks live on the floor next to the hamper. As the American sociologist Arlie Hochschild wrote, “Every ‘I’ comes with a ‘we.’ We depend on others, and stand ready to be depended upon.” When Ms. Hochschild wrote about emotional labour in books beginning with 1983’s The Managed Heart, her subject was the professional aspect of “emotion management.” In other words, there are any number of professions, from flight attendant to nurse to child-care worker, which are predominantly filled by women, and which require a component of emotional stroking of the public: smiling, caring, listening, allaying fears, being attentive. The problem, of course, is that many workplaces do not support that affinity. “Women’s work” in the home is profoundly undervalued, as feminist economists have pointed out for decades. When it is remunerated outside the house, it’s often at scandalously low rates – think of care workers for the elderly or for children. Men are taught from an early age that these professions are not for them; they bring neither the status nor wealth that are the traditional barometers of worldly success. What if emotional labour is less about male-female tensions than it is about how we live in an economic system that diminishes and dehumanizes people of all genders and reduces us to ambulatory, fleshy bags of consumer desires? A system that says caring is, basically, worthless and therefore unworthy of male ambition and attention? I know this may not be the most satisfying fodder for boozy late-night gripe sessions, when you and your girlfriends want to talk about how he leaves dirty mugs all over the house, but bear with me. “Did you load the offers?” The couple ahead of me in the checkout line at the grocery store were eyeing each other, and not in a particularly lovey-dovey way. They were each holding their loyalty cards, and it was clear that neither of them had loaded the week’s offers. She rolled her eyes. He sighed. I am willing to bet, based on the balance of probabilities, that the young man ahead of me did a lot more domestic duty than his dad did before him. Like my husband (that one dereliction of Mother’s Day duties aside), he probably cooks, cleans, does laundry and wanders Shoppers Drug Mart with an infant sagging in the Baby Bjorn strapped to his chest. He might not do it as thoroughly or as often as his partner likes, but he’s trying. There is so much loading to do in the modern world. Did you load the offers? The dishwasher? The dryer? The recipe ingredients on your phone? The snow tires, so that we won’t perish in the first winter storm? We are offloaded upon; the tasks that used to be performed by other humans are now ours, and we have to divvy them up. We have taken on ourselves the work of bank teller, checkout person, operator. Labour that companies previously paid for has been shifted to our shoulders, on top of all the other work we already had to do. This is bound to increase friction in the household. At the same time, the heat has been turned up under the resentment kettle that I mentioned above, for a few reasons. Even as women are spending more time outside the home in the work force, they are still being sold a bill of goods about maintaining perfection, or something close to it, in the home and in the hearts of the people who live in it. Healthy lunches mean healthy psyches, people. Didn’t you see Bento Box Mom’s posts on Instagram? She clearly loves her kids waaaay more than you do. Or is that just the inherently selfish and lazy response shared by men who have been trained not to bother? I think Ms. Hartley would have said so, at least at the beginning of Fed Up, when she is driven to distraction by a large tub filled with wrapping paper that her husband has failed to put away for days on end. Yes, he’d wrapped the presents, and yes, she could have asked him to put it away, but her point – it led to a teary fight – is that she didn’t want to have to ask him. She wanted him to take on the burden of knowing that it should be put away, without her having to ask. This, it seems to me, is the crux of the issue. It’s not about who buys the birthday cards, it’s about how we value or diminish caring, both inside and outside the house. Teaching men that their emotional landscapes are without worth is as harmful to them as it is to the women in their lives. The debasement of caring means that both men and women have to live in a world that does not reward the professions that should be the most valuable, and cherished. Once, Martin Amis wrote a short story that turned reality on its head: In it, poets were hugely successful and wealthy, and screenwriters lived on scraps and toiled in obscurity. Imagine a topsy-turvy world such as that, where carers, nurses and teachers were the most valued professionals, and could pick and choose jobs with platinum benefits and perks. Perhaps emotional labour just has a branding problem. The word “labour” carries unpleasant connotations of days spent picking turnips or, even worse, giving birth to children. What if we didn’t think of it as labour, but as pleasure? The pleasure that comes with knowing you’re part of a community, kin or otherwise, and not just a helpless cog in a machine? This may prove difficult when you’re in the grocery store arguing over who forgot to load the offers or buy the Mother’s Day card, but there is value in stopping to remember that at least you have someone to buy a card for. Someone who just might remember to buy you a card, and make breakfast, when Father’s Day rolls around.